Above is a list of the top 10 most frequently cited standards following inspections of worksites by OSHA. 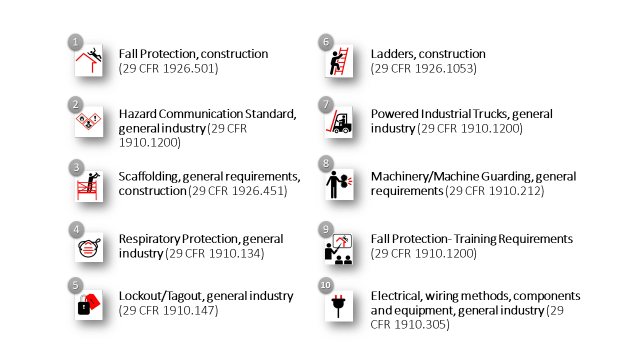 Fall protection was the number one citation again, and we have previously examined the connection between fall hazards and fatalities in the workplace as well as the importance of building a safety culture in your workplace. Read on for the top 10 citations of 2017 and then check out our articles on the National Safety Stand-Down and hazard communications to help prevent injuries and citations.